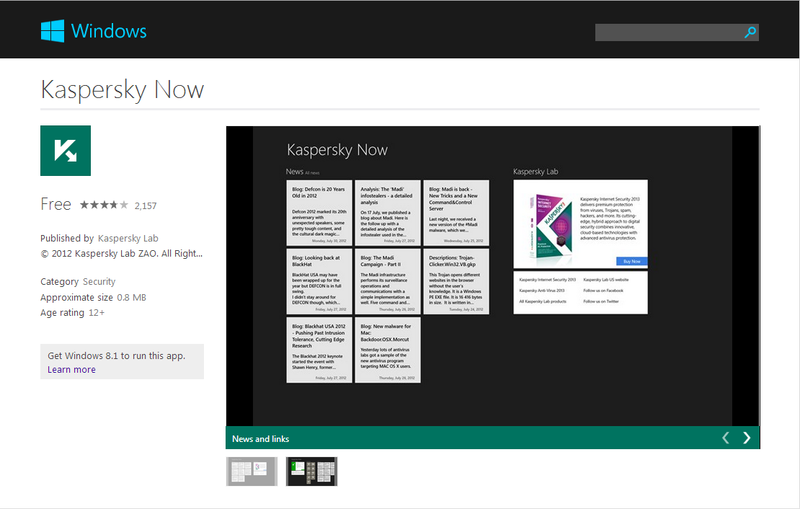 If you use Windows 8.1 and you like its multicolored and dynamic modern interface, you can install the Kaspersky Now application. It allows you to view the protection level of your computer right on the Start screen and lets you get the latest news on information security from the securelist.com website. Kaspersky Now is a modern-style information panel that can be used for running basic functions of an antivirus solution installed on your computer (Kaspersky Internet Security or Kaspersky Anti-Virus). If you have no Kaspersky Lab product installed yet, Kaspersky Now will deliver news from securelist.com. 1. In the Start screen, click or tap Store. 2. In the Security section, click Kaspersky Now. 3. On the Kaspersky Now page, click Install. With Kaspersky Now, you can see the protection status of your computer on the Start screen, and run basic antivirus tasks: Scan, Update, Safe Money, Parental Control, etc. 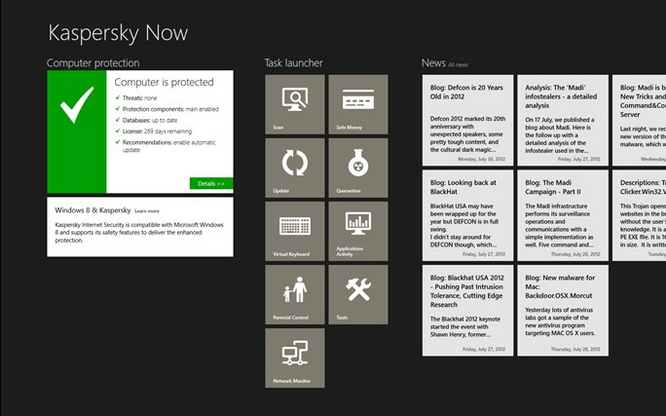 If you want to remove Kaspersky Now, right-click Kaspersky Now on the Start screen and select Uninstall.